Whooooo! Ric Flair remains an iconic name amongst wrestling fans today, despite it being a long time since the man was “The Man” and in his prime. But he remains popular due to his legendary status and because his last WWE match was only in 2008 (which we’ll come back to later). This DVD has a documentary which covers Naitch’s entire career from when he got his start to the end of his active WWE run over the weekend of WrestleMania XXIV, as well as including ten matches, bonus interview footage and several promos and segments. It has some nice old-school artwork on the DVD box and on the menus, which I personally felt was a good little touch. The main feature clocks in at around two hours, and does a good job of highlighting Flair’s highs and lows from his long and glorious career. As well as archive footage and stories from Slic Ric concerning key events in his life, we hear from talking heads spanning Ric’s entire career such as David Crockett, Greg Valentine, Dusty Rhodes, Arn Anderson, Jim Ross, Ricky Steamboat, Triple H, Randy Orton, Batista, Shawn Michaels and many others, as well as members of his family. Flair is very honest, at times too honest, and on occasion painfully honest about his own perceived failings as a father and a husband. Fans of the Nature Boy should get a kick out of this documentary, which to be fair doesn’t offer a great number of revelations but is an entertaining watch that covers most aspects of Flair’s legendary body of work in pro wrestling. Some faults are that we’re given the impression that Flair was still a top-level wrestler when he was in his 50’s, which besides one or two great matches simply wasn’t the case. Also, two key issues surrounding Flair (the 1991 jump to the WWF and his problems with WCW head honcho Eric Bischoff in 1998) aren’t explained very well. And whilst we do see clips from WrestleMania XXIV weekend, the talking clips were clearly recorded before Flair’s three-day retirement ceremony. It would have been good to use this and then see Flair comment on the events afterwards, but we have to just assume that the whole weekend lived up to Flair’s expectations (which it did, to be fair. Or fair to Flair for you Bobby Heenan fans). Overall, though, it’s a good documentary; it isn’t one of the very best WWE has produced, but it does cover most aspects of Flair’s decades-long stint in the industry, and is engaging enough that it merits a second viewing sometime down the road. The match choices are interesting. Since some of Ric’s greatest bouts were on The Ultimate Ric Flair Collection (and by the way, I think the two DVD names are too similar; I’d have called the product under review “Whooooo! 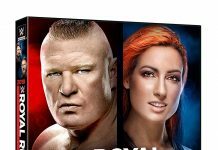 The Ric Flair Story” to differentiate it more), it reduces the number of epic clashes available for this release. That being said, Flair had so many memorable matches that it wouldn’t have been stretch to find enough to make this another vintage DVD. Instead, though, we get a selection that does cover Ric’s decades in the field of sports entertainment, but from which very few are what you’d class as being amongst his best work. A 1982 TV bout with Jack Brisco is fairly entertaining and historically interesting. A two-out-of-three-falls match with Kerry Von Erich is typical for the era in showcasing Flair’s ability to lead a less talented opponent through a long match, and make him look good in the process, but has a poor finish and, as good as the match is, their Cage match on Christmas Day 1982 was their most famous meeting and perhaps should have been here instead. It does, however, show how Flair could go into any territory and prove that he was The Man. Flair vs. Harley Race is actually the match which set up their Starrcade 1983 meeting where Ric won his second NWA title. It’s good but it would have been more at home on the first Flair DVD; here, you watch this match and then you want to see the Starrcade bout, but it isn’t on this release. Instead, we next get a six-man tag that highlights the Four Horsemen before a hot-as-hell crowd. I liked it, but as I had noted for the recent Wrestling’s Greatest Factions DVD, the best way to spotlight the Horsemen is with their specialty match, that of course being War Games. Next up is one of the two highlights of the DVD in terms of matches, that being a truly great battle with Sting at the first Clash Of The Champions. This went head-to-head with WrestleMania IV on live TV and did a great rating (which shows how much more popular wrestling was then than it is now), and is a classic in its own right that, as they say, “made” Sting. They would go on to main event many future shows, but this meeting is their most famous and arguably their best. Disc two ends with a very good and intense showdown with Terry Funk at the 1989 Great American Bash. We had their I Quit match on the last Flair release so it’s good to get their other high-profile meeting here. There is a void before this match selection-wise which I will touch upon shortly. After concentrating on the 1980s on disc two, disc three enters the 1990s and opens with Ric’s MSG meeting with Rowdy Roddy Piper in 1991. It’s an enjoyable match and is interesting to note for the babyface reaction Flair receives when he walks down the aisle at Madison Square Garden (a rarity for heels during this era). However, I don’t understand why this is the only meeting from Flair’s first proper WWF/WWE tenure on the DVD. Surely we could have had Flair’s WrestleMania VIII showdown with Randy Savage, a WWF Title match against Bret Hart or his Loser-Leaves-Town clash with Mr. Perfect on Raw from January 1993, which ended Flair’s run in the company (and by the way, none of these feuds were referenced in the documentary, which is particularly disappointing for the memorable dispute with the Macho Man), or at least something else from this chapter of Flair’s career. The next match we do get is his Spring Stampede 1994 main event with Ricky Steamboat. It’s a very good match, but again I hold my hand up to ask: why don’t we get their first 1989 match from Chi-Town Rumble? For those unaware, Flair and Steamboat had a truly classic three-match series in 1989, two of which we got to see on Flair’s first DVD (Clash Of The Champions VI and Wrestle War 1989), so by rights we should have gotten the bout that completed the series on this release. Fair enough, we do get an unreleased meeting of Ric and Ricky, but while it’s a good effort (and Bobby Heenan comes out with some of his trademark wit on commentary), it can’t compare to their 1989 feud. Plus, the ending here is a mess; we’re under the impression that Steamboat pinned himself in a submission hold when he actually did not, and there are no post-match replays to back up the confusing decision. Plus, I think the commentators get mixed up with the move that The Dragon used to beat The Nature Boy in their 1989 series; a minor thing, but slightly distracting nonetheless. From this point, the classics became less frequent for Slic Ric (a fact not acknowledged in the documentary, as alluded to earlier), so our next featured match is over a decade later, at Taboo Tuesday 2005. This is a very bloody steel cage match between Flair and Triple H which Flair somehow wins despite being 56 at this point. The best way I can describe it is that, for a Flair match by 2005 standards, it’s good. I personally enjoyed their subsequent Last Man Standing match at that year’s Survivor Series more, but that’s just splitting hairs. One very deserving inclusion, and the last match on the release, is Flair’s bout with Shawn Michaels at WrestleMania XXIV. This is brilliant considering Flair had not long turned 59, but even if you ignore Flair’s age, this is an excellent and very dramatic match with Flair’s career at stake. I mentioned this in my review of WrestleMania XXIV, but it’s worth saying again that Shawn’s “I’m sorry. I love you” before superkicking Flair into retirement is as emotional and heart-stopping a moment as any in wrestling history. Plus, we get the pre-match promo video which is awesome. The other extras consist of 1980s-era Flair promos which emphasise how good he was on the microphone, although I feel he was slightly overrated, He was undoubtedly charismatic, but considering that he was king heel at this point, there are too many instances of Ric trying to pander to the crowd. The Rock could get away with it as a heel because he included enough insults to ensure that he kept receiving boos, but if you didn’t know better, one would assume from these segments that Flair was actually the lead babyface for the NWA/JCP/WCW in the 1980s. The other bonus segments are some extra interview chapters for the documentary (plus Flair being present for when his home state declared a “Ric Flair Day”, during which I thought “I hope Flair doesn’t start crying again” … and he does start crying! ), and the excellent retirement ceremony for Flair on Raw the night after Mania 24. Billed as his Farewell Address, it ends up being a half-hour tribute where the entire WWE roster at the time, as well as a number of legends synonymous with Flair’s career and of course the thousands of fans in attendance, simply say “Thank you Ric!” It is very touching, and is the perfect way for Flair to say goodbye to pro wrestling after his retirement. But of course, as you may know, Flair would wrestle again, firstly for the very short-lived Hulkamania promotion in Australia in November 2009, and then in TNA from 2010-2011. Without being harsh, Flair didn’t have one good match in either group, and at times was simply embarrassing. This was obvious at the time, and before Flair donned the tights again, but it bears repeating that Flair really shouldn’t have come back to wrestling after WM XXIV. Nevertheless, Flair hasn’t wrestled for WWE since his meeting with Michaels (some might say that Flair had a match on Raw with Randy Orton in 2009, but it was a brawl rather than a match and, to me, does not count as a match), so the whole retirement weekend still holds weight, at least within WWE lore. As for the DVD as a whole? Now, I have to be honest: I’m not that much of a Ric Flair fan, and never was. I respect his accomplishments and his talents when he was at his peak, but I always felt that he was a bit overrated, and it annoyed me how he would denigrate his counterparts like Hulk Hogan, Bret and Savage, even after they were no longer at the top of the mountain, but praise himself and his friends within the business. This leads into my feeling that Flair was and remains somewhat egotistical. Case in point: Flair, at age 66 and decades past his prime, during which time many wrestlers have proved to be as good as or even better than Flair, appeared on Raw this past Monday and stated that he was “God” and the greatest of all-time. For another wrestler, I would say that the lines were scripted, but with Flair you truly believe that he believes those statements. Hulk Hogan is classed as being very egotistical to many, but even he wouldn’t call himself God, especially when trying to provoke cheers from an audience. There’s also the fact that Flair, throughout his career, only ever played one character, that being the confident and arrogant ladies’ man, and only changed the formula based on whether he was a face or a heel. Some might say “well, it was a great gimmick so why change it?” True, but look at Triple H, who went from a blueblood to a degenerate to a corporate sell-out to a hard-man to, well, a carbon copy of Flair in Evolution, to a somewhat older degenerate to a corporate figure in the form of the COO. Shawn Michaels was at various times a high-flying youngster, a cocky punk, a degenrate, a religious goody-two shoes and other things. Hell, even The Undertaker at one point was Undertaker in name only when he began riding motorcycles. Therefore, as good as Flair was, I would have liked to have seen if he could have pulled off a different character, because almost all of the other all-time greats played various characters to show their versatility. Nevertheless, this DVD emphasises just how good Flair was and that he does deserve to be in the conversation for being the greatest wrestler of all-time. And I think that shows how good this DVD is: if it can convince me, someone not very fond of Slic Ric, that Flair was one of the best ever, then it must be an effective presentation. I still don’t think he’s the best ever, but I do think that if you’re compiling a top ten, Naitch will be a part of it. To be fair, it does have a very good documentary and a good if questionable match selection. One thing it does lack, perhaps due to time constraints, is Flair’s Hall Of Fame induction, a notable absentee since we get literally every other aspect of Flair’s retirement weekend. But since it went on for nearly 90 minutes, I can understand why it wasn’t here. 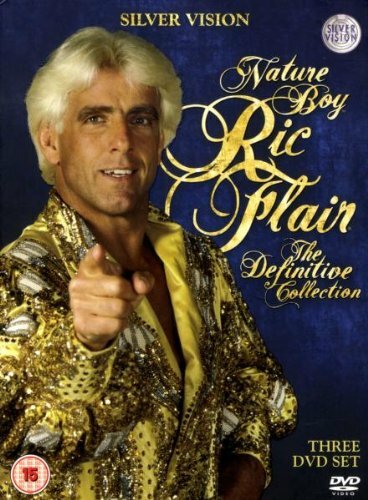 To conclude, if you’re a Flair fan, you’ll love this DVD, although it is a step down from his first DVD. But even if you’re not a Flair fan but you are a wrestling fan, like me, you’ll still enjoy this release and realise why, despite the criticisms and his shortcomings, Ric Flair at one point truly was, and to some will always be remembered as being, The Man.